Are you seeing fine lines and wrinkles slowly overtake your facial features? Are you suffering with acne scars or uneven pigmentation due to sun damage? If your skin is looking older, less smooth or less even than you’re comfortable with, there is a procedure that can help all these things (and more!). It’s fractional laser resurfacing. Fractional laser resurfacing is the latest twist on resurfacing technology. Years ago, if you suffered with these skin problems and wanted to do something to help, your choices were limited. Full ablative resurfacing was your only option which meant that you were facing a long recovery fraught with potential pitfalls (infection, scarring), and if you had darker skin, you were simply out of luck! You weren’t a candidate for the procedure! Well, not today. Times have (thankfully) changed a lot. Now, you have several different options available if you would like to do something for these common skin issues. Today’s most popular procedures are Fraxel and Sciton Profractional laser resurfacing. It takes the energy beam that traditionally was used in full ablative procedures and fractionates it. It’s sort of like breaking a beam of light into hundreds or thousands of smaller beams. Imagine you shine a flashlight onto a wall. Now, place a filter, (sort of like a colander) over the end of the flashlight and look at the difference this makes in how the beam hits the wall. Fractionated technology works just like this. In the case of the Sciton Profractional, Erbium is the energy source. Because Erbium produces a wavelength that is highly absorbed by water (our skin is mostly water), it’s a great alternative to traditional CO2 resurfacing. By changing the “density” of the filter, you can remove or ablate more or less skin. This allows for much more specificity in fractional laser resurfacing, meaning that treatments can truly be tailored to your individual needs. Fractionation also allows you to heal much faster than traditional, full ablative procedures. This is because injured skin needs healthy, surrounding skin (sweat and hair follicles) to heal after it’s damaged. 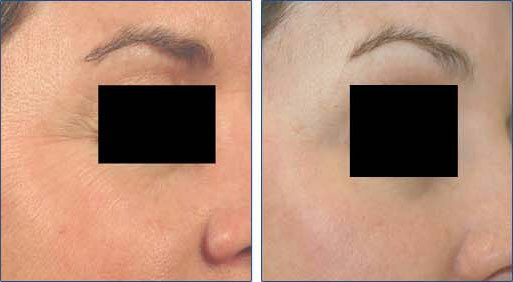 Fractional treatments essentially allow for little “islands” of spared, untreated skin to be left behind. This means that 2 to 3 weeks of healing with traditional, full ablative treatments can be cut to 5 to 7 days with fractional laser resurfacing! If you’re wondering if the results are less dramatic, the answer is not really! Similar results can be attained with fractional technology with much less risk of unwanted side effects and dramatically faster healing times! Does this mean that we never choose full ablative procedures anymore? No, they still have a time and a place, but fractional treatments have opened up a new world of specific treatment options for many different patients that the older technology couldn’t allow. Fractional treatments can still hurt. Because this procedure still involves the ablation of skin tissue, it can be uncomfortable. Topical numbing cream, dental nerve blocks (lidocaine injections) and prescription pain medications can all be used to make you more comfortable during your procedure. It’s important to remember that while you will heal more quickly, you will still need some recovery time. In the first several days after fractional laser resurfacing, there can be dryness, irritation, redness and peeling. Usually though, after the fourth day, your skin is typically completely healed. However, you still may not look completely back to normal as redness is very typical. This can start on day five and last for 1 to 2 weeks. Your skin is fresh and fragile at this stage, so sun exposure is strictly limited and you absolutely must wear sunscreen during this time to protect your skin. Read our top Wrinkle Prevention Tips and Better Than Botox pages.